This is one post I can completely identify with and especially risking life and limb in order to collect something off, of the side of a busy highway/cliff/bridge. I guess that makes me an obsessive collector. Of the eight points, seven apply to me, as my friends just do not understand my obsession. 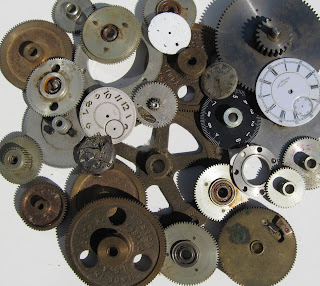 I have to admit there are a few items I have been unable to come across like old watch faces and especially the inner working of a watch with all the wonderful spoke wheels. I see you to have a badger skull, mine which I have had since being a teenager. I love your monkey skull, that one is real special. Maybe we should start a chain reaction by following your post with one of our own, featuring some of our collection. Thank you Donna for making me feel legitimate and normal! Oh dear, all 8 I'm afraid. This summer, whilst on a lovely country walk with my children, we came across a patch of scarred earth where a car had been burnt out. Within minutes the children were rummaging through the (still warm) embers, and ignoring my weak pleas for them not to touch! 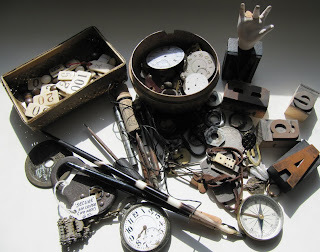 We found endless "treasure" that day; rusty metal, beautiful fused glass etc. I love scavenging. Oh forgot to say how I love the quotes too! I collect far too many things. I am especially drawn to old metal objects. I have a few pocket watch faces, dice, and type set blocks, like you do. I really need to start collaging. This piece you've pictured is wonderful! Wonderful inspirational words and terrific images and a truly great collage, (if that is the correct description) if this does not motivate me and others then I don't know what will. Thank you. Yes to all 8 .... and don't forget rust on your clothes. I've ruined many a good blouse because I just can't stay away from my rust pan. All the images on this blog are to drool over! Only a few apply to me. So far. I'm always finding leaves in my house. I can't open a book without a leaf falling out. And if I buy an ancient book and find pressed leaves in it, I'm thrilled beyond belief. I find leaves in bowls, cabinets, books, various places in my studio, etc. My daughter is now a leaf collector. Had to laugh out load at the #1! This is especially true for me when I'm on the Harley with my beau! There is constant temptation to jump off and grab stuff. I once talked my family into hiking into the woods and removing the rusted door from an abandoned vehicle and hauling it down a narrow, tortuous path. Does that count? You've selected some graceful quotes to accompany your collections. Poets do appreciate "layers." ...at the moment, I'm collecting industrial waste! there I said it. I especially like anything that could possibly be inked up and printed! 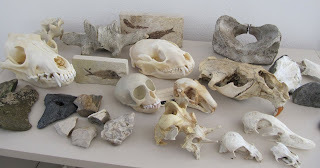 In my collection of animal skulls--- some of them are replicas, some were given to me and some were found out on the beach or on hikes. Your piece in this post is intriguing too. BTW, I found something for you, posted it on Wednesday. PS I really like the re-emergence of the 3 crows in this. I think I'm a collector of images - one of the benefits of being a photographer is the ease with which you can collect them (no sweating or rust in the hair). A well-known photo editor recently explained how going out and taking pictures is now more about collecting raw material to do something with later in the studio. Before digital capture, you were more inclined to seek the final product in the field. I guess I'm a second generation collector, collecting images of things instead of the things themselves. Bob, what an astute and reflective comment-- I never thought of photography as collections-- thank you. jgy, thank you so much for the wonderful 'gift' in your Wednesday post--- loved the found papers. Wonderful art piece and the quotes so perfect! I am freakish over bits of paper...I cannot begin to describe the boxes of papers I have all over the house. I would say about 4 of the 8 apply to me...! Fun post. Looks like you were describing many of us...including myself!! Great photos of some wonderful collections. I love your artwork you chose to display with these treasures. I love the crows and keys and jangley bits! I collect seed pods, nests, feathers....natures ephemera! I am told by certain family memembers that I have enough so I frequently remind them I am atleast cheap to keep! lol. "Friends/neighbors leave dead birds, animal skulls and bones on your front porch." Made me laugh...I have to show your post to my wife, Marie, since she thinks I collect too much - but clearly I am in the bush league. I used to collect bird books (field guides, where to find) and art/photography books. Hostas - I used to get all odd varieties shipped. I like rocks, but it has been a while since I brought any home. Seaweed - to make compost. After Halloween I would go around the neighborhood to get all the thrown out bales of hay...compost, again. Busted. And I see I've managed to find a bisque doll arm that you seem to be missing. True confession 1: I am waiting impatiently for a recent purchase of a skunk skull with ALL of its teeth. I know, I know....enviable me. Ironically, Thursday evening my Yorkshire Terrier was skunked. Karma? 3. I have several boxes that contain many boxes of boxes. And the drawers? One can never have enough drawers...especially small square drawers that are highly inefficient. Bonus points if they are wooden, vintage and have Asian characters on them regardless of whether or not you know what their meaning is. 4. I keep a bowl of rust on hand...just in case what I find just isn't grungy enough. 5. My housekeeper once found one of my dead birds (a male Red Flicker) in the freezer. She still cleans for us AND has also become one of my volunteer collectors. My most recent obsession - chalk board images - markings. Also scales - old black ones. And plumb bobs - brass. And brass bells. And shells, and leaves. And dry weeds and grasses. And sticks; especially red ones, arranged in my pottery collection. And small old containers, especially wooden ones. And I have the marble collections of each of my parents, stored in old glass jars. And old papers and letters and envelopes and ledgers and diaries, especially with pressed flowers in the pages. And old alphabet blocks. And croquet balls - old ones. And....oh my. Great post Donna! Oh and art books! Lots and lots of art books! My obsessions seem to be fading since selling my record collection and donating most of my book collection. This tells me that a new obsession has not, yet, settled upon me. Oh thankyou for this. The quotes, the images all resonate so. ...Stones and feathers and rust.I'm always looking at the ground wherever I go, hoping to see something interesting to incorporate in a textile piece.My husband was amused that, packing to return home from our last overseas trip , there were many stones in the suitcase, scratching his head when I told him that others do it too! Had to come revisit this post - since the images threw me into such a frenzied excitement I couldn't concentrate on the superb collection of quotes and poems you peppered your collections with. And, also another lovely collage. Bravo. Wow Donna!!! When I saw what you had made I thought (yet again) that we are so connected!!! All the images and writings are so great. Loved this!!! I'll swap you some kangaroo bones for any bird skulls you have..
what a fabulous, fabulous post, and tremendous photos. i will have to remember this quote: "The seduction of the object is too much to resist." i should have it tattooed on my right forearm to remind my husby that he needed ask "why" anymore when i bring in heaps of "junk". 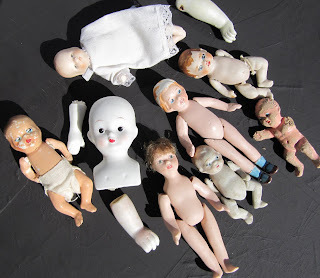 my biggest collections consist of dolls/doll parts, birds/bones/bugs/other interesting creatures/dehydrated fetuses of various sorts, rusty stuff, eggs/nests, rocks/stones, odd shaped glass and glass bottles, nails/screws/hardware of various sorts, tools (even ones i'll never use), gears and small drill thingies and mini saw blades, preferably circular, cigar/cigarette boxes/tins, anatomical images, vintage erotica. those are "the biggies" at least. Your posts are put together so beautifully. Your passion for artful expression truly shows. I have an affinity for driftwood, rocks, and shells. I have them in my house, in my yard, and usually carry small rocks with me in my pockets wherever I go. I make things with them as well. Crystals, fossils - oh and old-fashioned 'saucy' postcards, especially when they have a love note written on the back. For me it is a reminder that many have gone before us and have been in love - isn't it the most wonderful thing? I may have to do a post on this. I so relate to numbers 5 and 6 !! rocks on the side of the road, whatever I can pick up without breaking my back; pine cones -- little ones and big (I stashed 3 huge ones from Lake Tahoe in my backpack to take back to CT! ); odd shaped sticks is the latest -- I plan to paint with them . . . You have certainly hit a nerve with this entry, Donna! What fun to find out I'm not alone/looney!!! Thanks for finding my Aikawarazu blog, I probably could make it more obvious that there's 2! On visiting again I love the quote you have here by Octavio Paz. It's nice to come back and see it, and focus on that part of the post. It's like coming to a gallery again too, and looking again at the work. BTW, on one of my recent posts you mentioned a TS Eliot quote. Were you referring to the one here? I've been selling off my collections and feeling more then a few pangs of anxiety as I do. Some things I'm not ready to part with, like my library card cabinet drawer full of tiny newt skulls and various bugs & feathers. Other objects I am ready to let go of. I know that I am opening up for something new. I have just a small notion of what it is, but don't have a complete picture yet. I find that I do look at the ground so much when I'm walking that the neighbors must think I am depressed. And I always have stuff in my hair. Often small fragments of paper stuck with glue! It seems so simple, to re-use what's around us, rather than tear down and rebuild, no matter what it is. Creativity is indeed a plus. I meet 7 out of 8 signs of being an obsessed collector. Rust in my hair? What hair? Everything but no 4. Wonderful post. Thanks for sharing your amazing collections. 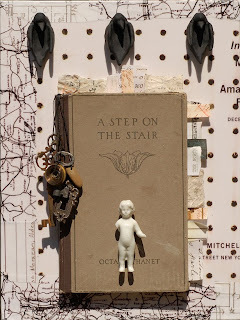 fantastic collage, fantastic blog !!! My desire is for broken china and pebbles and sea glass. Anything I can use in my mosaics.